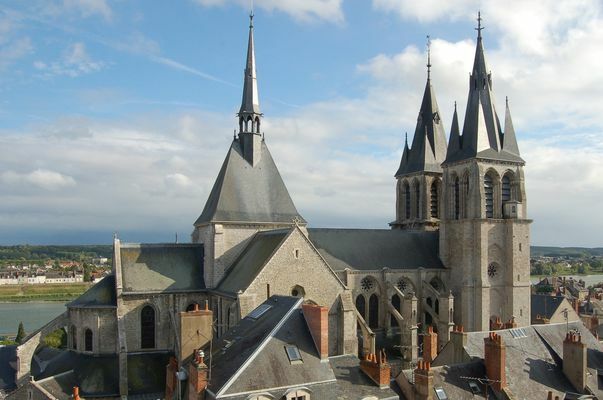 The Spires of Saint-Nicolas walking tour takes you to the district to the west of the town, around the former Abbaye Saint-Laumer. Head towards Place Louis XII by following the promontory of the château. 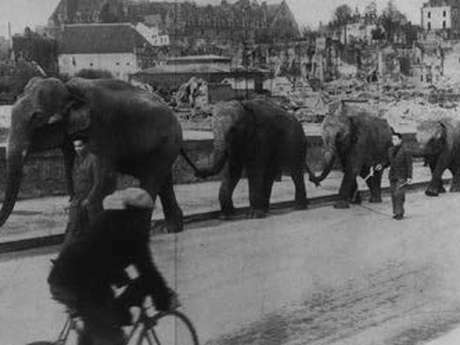 This centrally located district was destroyed by bombing in 1940 and rebuilt thanks to American funds as part of the Marshall Plan. A 19C theatre once stood at one end of the square but was demolished as part of the reconstruction of the district in 1958. Rue Saint-Lubin, which provided access to the Route de Tours, has preserved its medieval structure as well as its half-timbered houses from the 15C and 16C. The junction with the Rue des Anciens Fossés du Château is overlooked by a tower, the Tour du Foix, and the Gaston d’Orléans wing, built from dressed stone. The 13C tower has preserved its loopholes, with a broader stirrup-shaped lower slit to facilitate firing in all directions. From the top of the ramp on the Fossés du Château, enjoy the view of the Gaston d’Orléans wing, commissioned by the brother of Louis XIII from the architect François Mansart in 1634. The monumental classical façade was never entirely finished: above the doors, the fronton’s toothing stones were meant to be sculpted. Next, head down Rue Rochefort, which Flaubert described when passing through Blois in 1847: “The streets of Blois are empty; grass is growing between the paving stones; long grey walls extend along both sides, enclosing large gardens pierced here and there by a few small doorways which look as though they might only open at night to allow mysterious visitors in”. 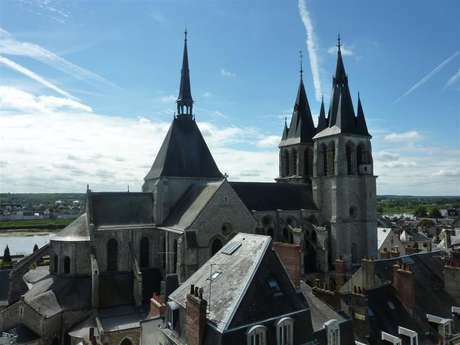 Walk along Rue des Carmélites to reach the Église Saint-Nicolas, the former Saint-Laumer abbey church, built over two periods of construction between 1138 and the end of the 13C, starting with the choir and finishing with the façade. Successive wars resulted in the almost complete destruction of the sculpted decoration around its doorways. Inside the church, the nave (central aisle), dating from the second period of construction, is based on the Gothic model of Chartres cathedral, while the choir, built earlier, is a fine example of the transitional style of architecture between Romanesque and Gothic: the walls are thicker, the openings smaller and the pillars sturdier. The capitals in the choir are all different and alternate between baskets of foliage and enigmatic figurative scenes. The sculpted bestiary ornamenting the corniche beneath the high windows is very much Romanesque in style. Note, in particular, the 15C stone altarpiece depicting the story of St Mary of Egypt in the side aisle to the left of the choir. 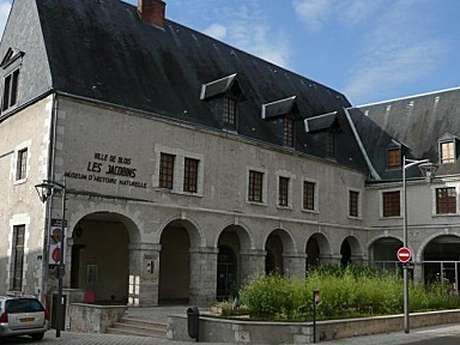 Continue along the Quai de l’Abbé Grégoire: here, you walk past buildings which were once part of the Abbaye Saint-Laumer; erected in the 18C and 19C, these once served as a hospital but are now home to administrative offices. The bridge spanning the Loire is the work of Jacques V Gabriel, head of the country’s Department of Civil Engineering in the early 18C. He replaced the medieval bridge situated 80m downstream, washed away in the glacial floods of 1716, as a result of large melting sheets of ice smashing against its piers. Walk along Rue Robert-Houdin, enjoying the view of the chevet of Saint-Nicolas and the wing of the abbey which housed its dormitory, before reaching Rue Anne de Bretagne, home to the Monastère des Jacobins, established here in the 13C. 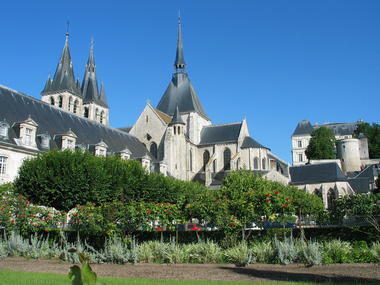 Nowadays, the monastery houses the town’s Museum of Natural History and Museum of Religious Art. On the square, the Louis XII fountain is the only vestige which survived the bombings of 1940. For a long time known as “les grandes fontaines”, this fountain was the most important in the town and at the heart of a water conveyancing system completed around 1511, which led one traveller to Blois in the 17C to comment: “It has glorious fountains and magnificent aqueducts finer than those in any other town in the Kingdom”. To the left of the central niche, note the coat-of-arms of the town, restored in the 19C: a shield in the shape of a fleur de lys held by a porcupine, the emblematic animal of Louis XII, and a wolf, the emblem of his grandfather, Louis d’Orléans. There is no review about Blois - Parcours Les Flèches St Nicolas, be the first to leave one !